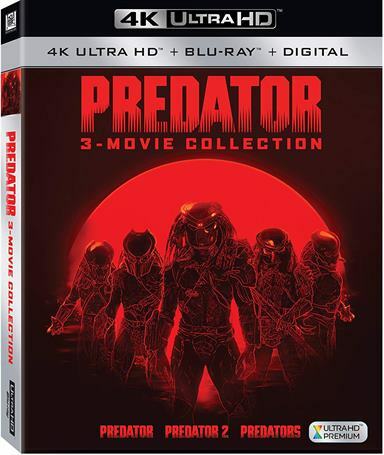 If you are a fan of the Predator series you should definitely go out and buy the 4K combo pack of the first three films. You won’t get better quality than this set. It's been a little over 30 years since we first watched Alan "Dutch" Schaefer (Arnold Scharwzenegger; Terminator) battle an alien "big game" hunter in the Film Predator. In 1987 The film opened to mixed reviews but has since become a "new classic" and shows up on endless "top 100" lists. Three years later it was followed up by Predator 2 for which Scharwzenegger did not reprise his role. Then, after a twenty year respite, Predators hit theaters ( forgetting the two crossover movies Alien vs. Predator in 2004 and Aliens vs. Predator: Requiem in 2007) in 2010. In anticipation of the latest film in the saga, The Predator, due out later this year, the first three films have been released in a 4K combo pack. Predator tells the story of a paramilitary group who are sent into the jungle of Central America supposedly to save hostages. However, what they find is not exactly what they signed up for when they reach an insurgent camp, kill everyone and retrieve intelligence. That is, of course, the least of their worries when they suspect they are being stalked - some feel by something not human - and are proven correct. Predator ends with most of the cast dying and Dutch setting a trap and killing the Alien but not before almost being killed himself. Besides Schwarzenegger, the movie also starred Carl Weather (Rocky IV), Bill Duke (Commando) and Jesse Ventura (Demolition Man). In Predator 2 the alien chooses a hunting ground closer to home - downtown Los Angeles. It stalks and kills members go rival drug cartels - The Columbians and the Jamaicans - and even members of the police force who are investigating both groups. Led by Lieutenant Harrigan (Danny Glover; Lethal Weapon) the L. A.P. D. first try to figure out what is happening once they realize there is more at stake than simply a turf war and then how to stop the alien especially after special agent Keyes (Gary Busey; Point Break) shows up on the scene. Two thousand and ten's Predators takes us off Earth and transports the humans to an extraterrestrial hunting ground. Several people including Royce (Adrien Brody; The Pianist) find themselves literally dropped via parachute into an unfamiliar jungle. None of them know how they got there but they all discover each is an armed killer. They follow Royce and when they reach high ground they discover they are not on Earth and are the prey being hunted. They also find out there are two types of aliens - the predators they had heard of and larger "Super Predators". They spend their time trying to stay alive and find a way off the deadly planet. Fox's latest 4K combo pack offers six discs - three 4K and three Blu-ray. The 4K 2160p video presentation is a marked difference from the 1080p Blu-ray as the quality is noticeably better and cleaner. The alien's mandibles (think corn rows) are individually distinct and the facial features are more grotesques. The included Blu-ray disc still has the horrible digital noise reduction (DNR) glossy sheen to it, but the 4k UHD is happily DNR free and amazing. While there isn't a lot of difference in special effect between Predator and Predator 2, there is a large distinction with Predators which there obviously should be since technology advanced by leaps and bounds in the 20 years between the second and third films. The DTS-HD Master Audio 5.1 is clean with little artifacting. Of course, it is an improvement over previous releases, especially for 2010's Predators. Each disc has a number of previously released extras amounting in hours worth of additional material to enjoy but the real prize in this set is the addition of a two-minute sneak-peek of The Predator coming to theaters later this year. Predator and its sequels have become cult classics though the latter two don't quite measure up to the first (they rarely do). Of course, the technology from the original is less advanced making the alien's weapon look like something out of an Atari video game. I also wonder about the design decision to give the alien corn rows ostensibly making it look like a big, ugly rastaman. However, if you are a fan of the series and are excited about this year's addition then you should definitely go out and buy the 4K combo pack of the first three films. You won't get better quality than this set. Download 3-Movie Predator Collection from the iTunes Store in Digial HD. For more information about Predator visit the FlickDirect Movie Database.